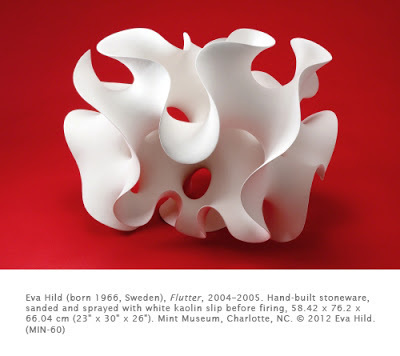 Just when I’m in danger of becoming cynical that there is very little in the art world that has not yet been done, I come upon this amazing artist: Eva Hild. This is my epiphany of the week (yes, I have those every week). Her work is so exquisite, so delicate, and yet so forceful, I would just like you all to contemplate on it. 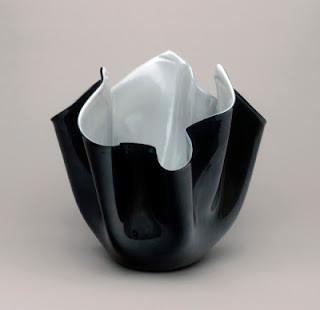 Aside from its organic nature, it sort of sums up the idea of “positive and negative space” in an amazing way. 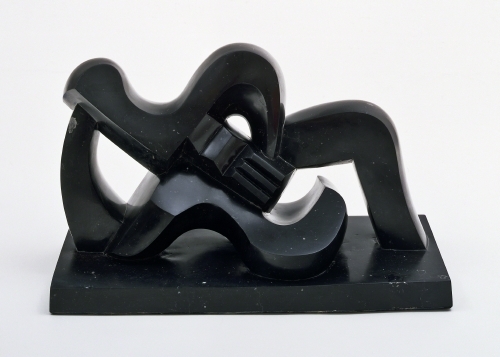 The evolution of ceramic as fine art sculpture began in the early 1900s with such artists as Joan Miró (1893–1983) and Jean Arp (1888–1966), and Peter Voulkos (1904–2002) in the 1940s. 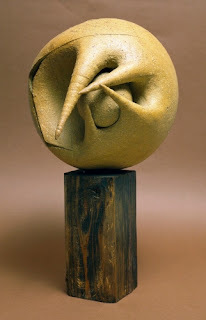 It has come full circle in the sculptures of Eva Hild. Hild is known for her ceramic sculptures in highly finished white stoneware. Her work emphasizes her ideas about the coalescence of inner and outer pressures, executed in highly organic shapes. They reflect the angst of the 21st century, in which monetary, societal, and political pressures affect everyone. 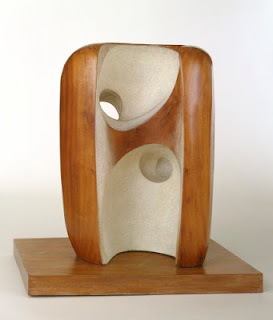 They also reflect the idea that the inner and outer worlds of human beings are connected through forms that effortlessly define positive and negative space. Hild’s organic shapes always sway in circular movements. Hild lives and works in southwest Sweden. She studied at the School of Design in Gothenburg. 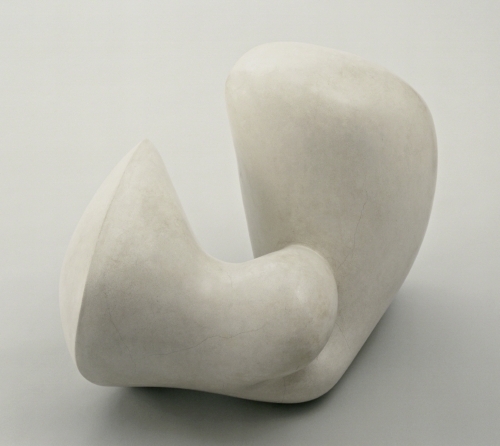 Her technique is comprised of painstaking hand-building of forms. She slowly expands the form without use of an armature. When the work is dry she polishes it with sandpaper to achieve a smooth surface and incredibly defined lines. 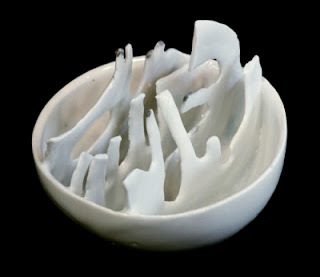 After the first firing, she polishes it further and then fires it again at 1200 degrees Celsius (roughly 500 degrees). The last step is to coat the works with silicate, a compound that is the base of glass and bricks. 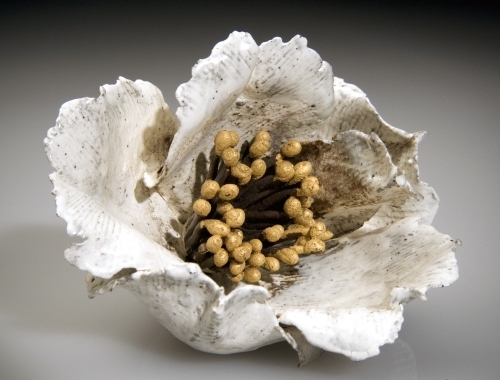 Check out her website (www.evahild.com) for more of her ceramic sculptures.